McVities are the British brand who are well known in the confectionery market; they produce a large product line of biscuits, which makes them a household name across Britain. 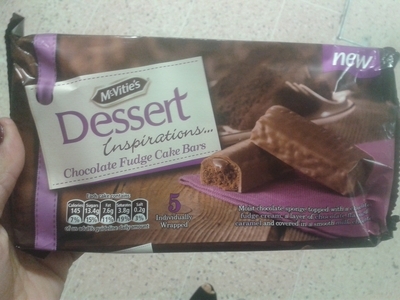 They have recently launched Dessert Bars in the UK, and my mother found these yummy after-dinner treats in the bakery aisle of Tesco. I had initially thought these were Thorntons bars when my Mother handed me one after dinner: the quality of the chocolate and depth of flavour was akin to something associated with established chocolatiers, not biscuit-makers. My mother is a self-proclaimed chocaholic, but she's picky when it comes to chocolate in slice form, or in any sort of bar, but she was adamant that McVities had done a fine job of creating something worth buying. The dessert bars are an amalgam of all things I like in a dessert: chocolate, sponge, fudge, ganache-like sauce. They are absolutely delicious, and one of the best dessert bars I've enjoyed this year. You might want to note they look similar to mini rolls, but they are not in fact rolled at all; McVities dessert bars, are in fact cake-bars, which consist of an inner fudge sauce which is surrounded by a light chocolate sponge and coated in thick milk chocolate. They're really quite decadent. Although an indulgent treat the portion size is just enough to satisfy your sweet tooth. One bar has just the right amount of chocolate to fudge, and sponge to bar ratio. The dessert bars come in royal purple packaging and have all the connotations of a refined treat. You should be able to spot them quite easily because they're new, but don't be put off by the fact they're made by McVities. I recommend these for kids parties, or grown-up parties, if you're trying to save money and would rather splash out on alcohol. The bars cost £1.80 in Tesco, but may retail a little bit cheaper if you go to Asda. Available in all major supermarkets I can't think of a nicer post-dinner, tea time treat.